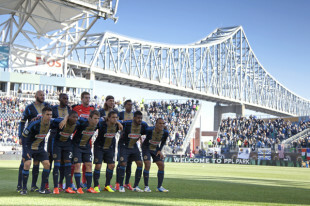 Philadelphia Union found plenty of good things this season. Amobi Okugo and Jack McInerney are rising stars. Zac MacMath progressed and answered some questions about his validity as a starting goalkeeper. Their forward corps may be the league’s deepest and is one of the best* from top to bottom. The Union have four solid defenders. But the Union also have issues to address if they want to become a quality, attractive team that sells out every game and creates enough demand for tickets that PPL Park grows by another 10,000 seats, which the Union need to better solidify the team’s finances. Here’s a rundown of some of those issues and a look at which players are likely to return next season. To draw and keep enough fans in a crowded Philadelphia marketplace, the Union must provide an attractive product. The pragmatic, ugly soccer of 2013 will not suffice in 2014, even if it earns a playoff appearance. Union manager John Hackworth must make the changes necessary to do that. It’s not enough to look for an individual player to be a great technical player or a hard-nosed athlete. Soccer is a team sport. The Union need to follow the Portland, Salt Lake and Colorado models and deploy players who pass and move, find space, and fit together like pieces of a jigsaw puzzle to create attractive soccer. If the current Union roster can do that, then keep them. After all, Caleb Porter was able to change Portland’s playing style and culture despite keeping many players from a bad 2012 Portland team. If Hackworth doesn’t have the tactical acumen to transform the team’s style of play, then his future may be as a technical director. Hackworth has identified good, young players (Okugo, McInerney, Sheanon Williams) and worked the trade market and re-entry draft well. He still has something to prove on the field in terms of tactics, game management, and style of play. I personally like Hackworth and think he has earned the right to show what he can do once he has a roster without budget constraints left by his predecessor. However, he knows as well as anyone that Eric Wynalda and Tab Ramos are available, and he needs to meet fan demands for a better product. The Union need major changes in midfield. The solutions begin with a creative central playmaker in the model of Diego Valeri, Federico Higuain, or Javier Morales. Kleberson could have been the guy, but he didn’t get off the bench enough and won’t return in 2014. Union scout Ricardo Ansaldi should be picking through South America’s dysfunctional leagues (notably Argentina) to find a playmaker who wants a more stable league where he can follow Valeri’s or Higuain’s example. Beyond that, the Union need to fill their midfield with actual midfielders who can handle the ball, not converts (Le Toux, Fabinho) and all-out wingers (Danny Cruz) who don’t function well in the short passing game. Le Toux should start somewhere, but if it’s in midfield, he must be complemented by technically adept, possession-oriented players. Keon Daniel is excellent technically, but he didn’t show the attacking instincts necessary to drive the offense in 2013. Michael Farfan needs to show that the Michael Farfan of old was not a mirage, and Hackworth needs to put him back in his comfort zone positionally. He could be an all-star again, or he could regress further. Farfan is the Union’s clearest building block in midfield but also may have the highest trade value around the league. Finally, there’s the question of Brian Carroll. He hasn’t slipped much defensively and is a model citizen off the field, but his inability to contribute to the attack hurts the Union. At this point, a holding midfielder with better passing vision may be necessary, and the Union appear to already have one on the roster in Amobi Okugo. So do the Union call time on Okugo at center back and return him to midfield? Many would say yes. Doing so would necessitate the signing not just of one or two backup center backs but also a starter, but many Union observers would say this is the way to go. As for other options on the roster, nobody has seen Gilberto play in a regular season game, and while Mike Lahoud is a valuable and flexible role player who adds a lot of character to the locker room, he was injured all year. You have to spend money to make money, the old saying goes. Investing heavily in a youth academy is a good thing. But if the Union aren’t willing to foot the bill for a designated player or two, it will say volumes about the Union’s investment group and their willingness to spend on the club. We’re not talking David Beckham levels here. We’re talking about the Valeris and Higuains of the world. Designated players are not some magic solution. Good players are. But they cost money. Philadelphia may be a tough sports town, but it’s not like that’s a surprise to anyone. If Jay Sugarman, Nick Sakiewicz and company won’t spend the money necessary to meet fan demands, MLS ought to find investors who will. Look at the 11 players who played the most minutes for the Union in 2013. Two are natural right backs who could start for many MLS teams. Two spent most of their time playing right midfield, and a third should have. That’s five players of your top 11 players at just two positions. In American professional sports, we typically call that trade bait. Considering the Union have clear team needs — a central playmaker, defensive depth, a true left back — they should consider putting their assets to work. Right back: Sheanon Williams and Ray Gaddis are exactly the types of players you want on a team: Young, talented, mentally tough, and versatile. The reality is that each is a true right back who could start there for most MLS clubs. One should be traded to fill other needs. Right midfield: Le Toux, Farfan and Danny Cruz can’t all play right midfield at the same time. However, only one of them is likely to have much trade value elsewhere in MLS: Michael Farfan, the most talented of the three. So do you trade Farfan? No. You fix him. He has star potential. Le Toux has made clear he doesn’t want to play elsewhere in MLS, which hurts his trade value. Plus, he is as close to a team icon as the Union have. They can’t trade him. He adds too much to the team on and off the field. But what is his trade value? He’s young (23), athletic, and capable of contributing right away. That said, any team with adequate scouting should know the book on Cruz. Two teams have already given up on him. Hackworth has known him since Cruz was a youth player, and his value is likely higher to Hackworth than other teams around the league. All this makes Farfan the most likely to be traded, if any of the three are, or once again deployed out of his right-sided comfort zone next year. But Hackworth has proved a shrewd dealer before and shouldn’t be underestimated in the trade market. So which Union players will stay, and which will leave? Here’s a breakdown. Jack McInerney $125,500 See comments for Okugo. Mac could agitate for a move sooner though. 95%. Wait, Ekra played in games!? I forgot ALL about his signing. Hearing that Carroll might not be returning next season; wants to finish out his career with a former club. There was an ESPNFC article saying that Nikolov is considering retirement. He’s definitely a Hackworth-favorite, but Hoppenot is looking to get a new deal. Show him the money, etc. Both Okugo’s and McInerney’s contracts run through 2014. Definitely hearing the team is pursuing a South American defender to sign in the offseason. Could be needed depth, or perhaps filling in Okugo’s spot if he moves up to take Carroll’s possibly vacated position. Well, Carroll is from the DC area and spent five years with them. (Played with Olsen.) Perry Kitchen could use a healthy partner next to him. Re: Nikolov, I think it’s more likely than not that he retires. I remember that article. DC’s clearing out their unwanted vets (DeRo, Ruiz, Pajoy, Saragosa so far) and will be needing experienced leaders going forward. I think Carroll’s move back is very likely. I like Carroll but i hope this is true especially if we can get something at all in return. Any chance Cruz also wants to retire in DC ? Cruz has a body a 40 year old accountant. Please DC… please take this guy out of this town. I was thinking about who would stay and who would go recently, but what I cannot seem to find is *when* everyone’s contract ends, which gives us a better idea of their status. Anyone know where we can find this info? Interesting post, but who (or what) is the source? Thanks Dan – that was a great break down. As a fan who gets attached to players, its nice to have an idea going in to the off season on who we might be losing so I can start preparing mentally. 1. Is the Colombian League that good that Valdez proves is world cup worth playing in it? 2. Granted I am Canadian and therefore a little biased, but could a healthy DeRo fix some of the union’s midfield problems. I know it would only be a stop gap measure until a long term solution is found but its something to think about. He is available in ReEntry draft. If they can get DeRo for that cheap, it’d be huge – similar to getting Conor Casey for a few hundred thousand dollars less than he was making in Colorado. Some of your comments are spot on. (Stronger central midfield) Some of them defy logic and I am almost pissed that you would make the accusation. 1. Fabinho is one of the best players to wear the yellow and gold. He is a must keep player and he will be an assist leader on the team and the league next year. 2. Le Toux is on the wrong side of 30. However he is also an assist leader. Very good defensively and is versatile enough to play up front and on the wing. To lose him would be a massive mistake. 3. Williams needs to be a priority for us. You lose him it will be a massive loss. 4. If you were to tell me that I would be singing MacMath’s praises at the end of the season, I would have said your are crazy. But that kid is the real deal. So well done. I loved that he proved me wrong. Players that need to go. 2. Daniels: Very technical, afraid to take chances, poor choices in the offensive third. On 50/50 balls he is a minus 20. 3. Brian Carrol. Nobody doubts his defensive stability and touch. However, if you watched him play I don’t think he make more than 15 passes all season that are forward. The last thing we need is a team that can only go east and west. And that is what we have. 4. Parke: I like that he is a local guy, and he is tough. But the the dude is a ball watcher, plain and simple. We literally watched guys dribble down the end line and pass the ball to a wide open man making a run. Or to a wide open man a foot from goal. Parke never controlled the box, never put himself in a position to cut down angles or even control the defensive 3rd. Too reactionary, too mentally slow and we need someone sharper. We do have to spend. And this is the biggest criteria that we don’t have and that we need. We need players who are willing to go North. Players who have confidence and can move the ball forward and not side to side. The Coach also has to get more out of what we have. We have a LOT of talented players that as a team played below their potential. We played predictable. And if Jack didn’t have the magic touch in about 3 different games our season / record would have looked far worse. That is possible. We had 18 games that were decided by one goal or more. We missed the post season by 1 or 2 games. If he is the leader in the back occasional lapses are the difference between making the playoffs. Even a single playoff game would add a 1/2 a million to 1 million dollars in the PU coffers for future players. Le Toux is 29. The 20s are the wrong side of 30? Can’t agree with you on Fabinho. The Union don’t wear yellow and gold. I stand corrected. I thought LeToux ws 31. Fabinho I believe is one of the best deliverers of the ball of the team. I wish he wouldn’t slow play down as much. But I respect his desire to take on players. The 2 parts that defy logic are that we have a solid back line. Because we don’t. We lost for than 5 critical games due to defensive lapses. Systematically we also seem to only start to defend in our defensive third. Teams like NY and LA put up the iron curtain about 30-40 yards from net. That means less shots on goals. And if fouls occur they happen farther from your goal. Southhampton this year is the best example of what I am talking about. PS: You may support the Navy and Gold… but I support the Yellow & Gold… ya got me there too..! Our back line had a part in 12 shutouts. They held KC scoreless in KC, held New York scoreless at RBA, and except for the 4 goals against LA and 5 against Montreal and New England were never awful. The Union were an absorb-and-counter so by definition they are going to absorb a lot of pressure and then hit teams on the counter. Don’t confuse the lack of midfield creativity and possession with a poor defense. If the back four were not solid we wouldn’t have sniffed 10 wins. True Steve, and that was my first thought. BUT – our defensively-minded midfield was a big part of our defense. We need a defense that can stand on their own and allow the midfield to join in the attack. That’s where Parke’s lack of quickness hurts us. 1-Do they believe in Hackworth? 2-Do they believe in the existing roster(generally)? 3-Do they believe in both or neither? The verdict is in on #1 and it nullifies #3, the Union are sticking with Hack. I’m not opposed to keeping Hack but believe if the team has ambitions and vision it has to decide between Hack and the roster as backing ‘both’ would be a bad decision. Now that the front office is backing Hackworth there needs to be a fairly high % of roster turnover to effect meaningful movement in a positive direction. In my book there are 4-6 no doubt starters in Williams, Casey, Okugo, MacMath, Parke, McInerney, & depending on how you view the roster and overall approach going forward maybe LeToux and/or Hoppenot. The midfield is an absolute wreck. The team lacks any kind of difference maker at all in the midfield with the exception of LeToux who is playing out of position. For me the best trade-baits are Fabinho, M Farfan, Carroll, Daniels whom becomes quite attractive to the right team, and Gaddis. I’m not opposed to package deals involving Hoppenot or GASP …. McInerney (one of my fav. 3 players in MLS). However the deal needs to be a good one and make real directional sense. For me no one on this roster is untouchable. There is a lot to be made of decisions of players relative to other players and the team’s plans going forward. There is give and take of players such as Wheeler & Casey whom represent such similar attributes, one with experience the other with youth/health. I can’t see the U trading Jack after all the outrage over LeToux. However, since those guys will finish their contracts next year, the U might get a better deal now…scary. Totally agree with your post. I’m fine with keeping Coach Hack but that means significant offseason moves ar necessary for significant progress to be made. Period. That made me spit my coffee onto my keyboard.You can’t say that when we’re 11th in GF. Yes, Jack’s a “rising star”, who ended his last few games not starting. Casey had a great bounce back season with 10 goals. Hopp’s 3 goals in 30 games = “stacked”? Those are some blue and gold glasses you’re looking through. We have 3 forwards worth discussing-Jack, Casey and SLT. I’d add another reason why SLT stays, he’s the 2015 striker after we lose Jack. “Hackworth has identified good, young players (Okugo, McInerney, Sheanon Williams) and worked the trade market and re-entry draft well.” It’s quibbling, but is our official stance now that He Who Must Not Be Named did not in fact oversee 3 drafts and also spent time with young players in the U-US program? Or all young players are Hack findings and broken down Saprissa rejects are the Dark Lord’s? Just want to stay with the narrative. To follow up on that, remember the outrage that Nowak dealt Mwanga for soon to be discarded Jorge Perlaza? How we railed against the coach trading a former #1 overall for a Central American Danny Cruz? Maybe, just maybe, wait -hear me out on this, Nowak wasn’t crazy and realized Mwanga was a bust. And, no stay with me for a second, tried to get anything of value for him. No? Not buying it? What if I told you he last scored 9/19. Of 2012. Nope? Ok, back to your regularly scheduled only John Hackworth recognizes value in Under 23yos and Nowak was a crazy man who traded away an awesome player narrative. Though if Hack was the guy identifying young talent on Nowak’s bench in 2010, then wouldn’t he also have input into the 2010 draft…he would’ve got away with it too, if it weren’t for you meddling kids. Sorry, I think Wheeler and Hoppenot are good backup forwards. I think the more Wheeler plays, the more he’ll impress. And the Union have three starting quality forwards. Top to bottom, that’s good. As for the young players I mentioned, the chain of development/acquisition/whatever-you-call-it is VERY clear on the three guys I mentioned. Okugo and Mac both played for Hackworth as youth internationals, and Hackworth was the one responsible for getting Williams to Harrisburg. The Farfans also played for Hackworth. The central American players were scouting finds by Gutierrez — the failures, and Mondragon, Valdes and Torres. Gaddis and Fernandes come through Burke. MacMath came through Vartughian. There’s a chain on nearly all of them. Nowak gets credit for Le Toux, the best expansion draft find ever. He gets credit for Califf. For Orozco. For Salinas and Jacobson. Those are not backhanded compliments either. I like all those guys. Seitz was his too. Now, is Cruz Hackworth’s guy? Of course he is, for better or (more likely) worse. Finally, as for Mwanga? We all saw him play his rookie season. Did he suddenly lose that touch? That speed? Those instincts? I remain convinced that Mwanga is talented enough to flourish in MLS as he did early on with Le Toux, but he was a sensitive kid who got completely mismanaged when he was very young. I mean, come on. We talk about “busts” and the like, but people forget that soccer players are human and you have to manage human personalities as much as on-field tactics. Mwanga was a Congolese refugee whose father was killed in the war, and people forget he was in the DRC — a pretty rough place — just 4 years before he joined the Union. Anyone who talked to him could see he was still a fragile teenager. He needed kid gloves. He needed the right environment. I think there’s a big difference between a couple of backups who are MLS level (though the jury is way out on Wheeler) and best top to bottom. I don’t think the Union forwards are in the same conversation as POR, LAG, SEA, RBNY, even the Revs with Fagundez. Even the off year in SJ, I’d still take Wondo and Lenhart. I like Jack and Casey, but there’s a tremendous drop from them to Hopp. The Union scored 2 or more goals just 9 times, it’s hard to say they have one of the best forward groups and not have the production to back it up.I respect you put a lot of info out there and I’m cherry picking on a couple of items. On your stay/go list, another reason Cruz should go – $120K. Same money as Jack without anywhere near the contribution. On the other teams … Fagundez plays on the wing of a 4-2-3-1/4-3-3, and New England had problems at forward until Agudelo showed up. They SHOULD be great, but Sene is often hurt and Bengston is a head case. Portland’s lone forward spot was Ryan Johnson most of the year (good player, mind you) and now they have Urruti, who’s unproven. (Their wingers are more midfielders than forwards.) The Galaxy … well, if Donovan’s a forward and not a midfielder (and for the Galaxy, he’s typically both at one time or another), then sure, obviously they’re better. With the Red Bulls, it’s Henry and … Espindola? Wright-Phillips? I like Wondo, but San Jose had problems early on because they lacked the depth that the Union have. Wondo even played this year on a broken foot. How does Nowak get credit for Le Toux? I remember it being somewhat of a shock that Seattle left him unprotected. Nowak gets credit for a move that every other coach would have made if they were in his position? If someone tells a crowd that they’re giving away a free $100 bill and that I get the first choice to keep it or turn it down, do I really get credit as an economic genius for saying “Don’t mind if I do”? Also, shouldn’t Nowak have credit taken away for leaving Andrew Jacobson and Shea Salinas unprotected in the 2010 expansion draft, especially considering he chose to protect Juan Diego Gonzalez, Toni Stahl and Michael Orozco Fiscal (whom he decided not to bring back anyway)? Yes, to the question in your second paragraph. (Jacobson was traded, but I know what you mean.) And yeah, it seems obvious in retrospect, re: Le Toux, but you also have to remember he was still a guy who hadn’t proved he could score in MLS. Either way, I’m not saying Nowak showed some special insight or not. Just saying he gets credit for picking Le Toux. I think what you said about Mwanga bears repeating. It was still a terrible mistake to give him away like that. When a young player who you know is talented (we all witnessed his first two seasons) has a sudden dip in his performance you know it is a mental thing that can be gotten over. Moving Okugo back to midfield and getting two centerbacks makes a lot of sense to me. I think that you try to sign or trade for a starter to put alongside Parke and then sign/draft a young centerback as their back-up. I think that a trade of Gaddis makes a lot of sense. I think that Williams is just a better player than him and with Gaddis, he clearly has talent and trade value given his low salary. The big question is what can you get for a right back in a trade. Maybe a draft pick, allocation money or another player with a larger salary. Hmmm, I wonder which one of those the Union would take. Allocation money for Ray-Ray? Oh Hell no! I love both Sheanon AND Ray. They are two of my favorite players. Thinking long-term though we might be better served dealing Sheanon because he is more likely to be poached by a foreign club recognizing his prowess. In other words: Would you rather have Sheanon for one year or return Ray to starting Right Back for the next 3 years? If I have to choose, I’d take Williams. I’m not sure Europe will come calling in just a year. Williams and Gaddis were the subjects of my Raves the last two seasons, so I get that people like them both. I do too. It doesn’t change the fact that there’s only one right back position on the field, and both of these guys are better there than anywhere else on the field. I’m gonna go against the crowd on one point and say that I’m not pushing hard to see Okugo in the midfield. While I agree that it would have been good for US to have him help out the midfield, I think he has the potential to be a GREAT centerback. His combination of athleticism and skill would very much fit the mold of the modern centerbacks in La Liga and a few of the better BPL teams. Granted, he seems to prefer the midfield, and I’m sure he would be very good (certainly better than we’ve had), but I don’t know if I see that same legitimate chance at being a superstar in the midfield as he has at centerback. Agree. It may have been by accident, but I believe Okugo has found his true calling at center back. Give him and Parke another year together. As their confidence in Mac Math grew over the season, you could start to see a real professional back line develop with those two and Williams. Find a real left back and this team will be quite stout in the back. You know how some of the players go train with a European club during the off season? Could they send Hackworth to ‘train’ with a European manager? One of the things I think the Union should look into is upgrading the coaching staff. One thing you often see in Baseball is with teams that hire young managers a veteran presence, usually a much older former manager (think Don Zimmer) is installed as a bench coach. The Union would definitely benefit from giving Hackworth someone like that to work with. A source of fresh eyes and tactical acumen who brings MLS experience to the table. To be honest, I think a lot of what this Union offseason will come down to is what happens in the draft. The Union hold the #2 and #6 picks in the draft. This is either great in the sense that the Union could pick up two highly rated stud players or trade the number #6 pick to fill a need (midfielder or defender). There are plenty of quality midfielders that could be in the draft as well as a stud of a striker by the name of Patrick Mullins (Maryland). If Mullins is there the Union should just pick him up as a “best available” pick. That said, trading the #6 pick could very well happen and in my opinion should the right team and right offer present itself. So really the entire offseason really depends on the 2014 SuperDraft. Pingback: But will they be fun to watch? When you’re writing with an academic tone, you are meeting the expectations in the academic genre. This is completed by taking images, placing it the other way up, and covering up all but a bit portion in the picture. can be an example of the headline that boasts a job title and keywords:. Here real articles writing jobs in Pakistan can assist you to to make that happen benchmark.